I use to think that this verse mainly applied to physical persecution but that is not true. This beatitude promise works with all types of persecution including verbal and emotional. 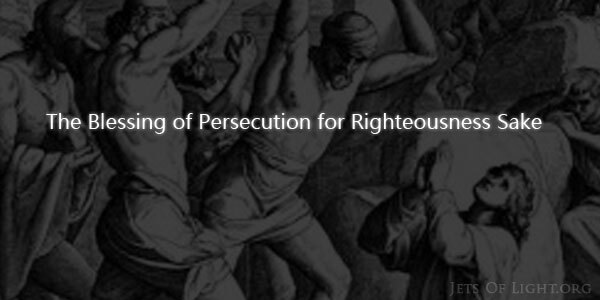 Here is what I found out about persecution and how God turns persecution into a blessing. G1377 – diōkō (dee-o’-ko) A prolonged (and causative) form of a primary verb δίω diō (to flee; compare the base of G1169 and G1249); to pursue (literally or figuratively); by implication to persecute: – ensue, follow (after), given to, (suffer) persecute (-ion), press toward. Did you know that the word “persecuted” means “to pursue?” I didn’t. To pursue something is not always wrong. A person can pursue in a manner to do evil or a person can pursue in a manner to do good. The Bible has examples of both usages. 2. Appropriately, to afflict, harass, or destroy for adherence to a particular creed or system of religious principles, or to a mode of worship. Thus Nero persecuted the Christians by crucifying some, burning others, and condemning others to be worried by dogs. See Acts 22. How Does God turn persecution into blessing? Let us first remember that turning persecution into a blessing is an amazing transformation. Let’s take the example of Stephen’s persecution found in Acts 6:5-15; 7. Note some of the characteristic traits of the people who were persecuting Stephen. Gathered intelligent people to refute the arguments of Stephen. Tried to convince the people that Stephen was preaching delusive (misleading) and dangerous doctrines. Had revengeful hatred towards Stephen. Witnesses were hired to bear false testimony. Were besides themselves with anger. Stopped their ears to hearing what Stephen was saying. Jesus is telling us we can rejoice and be exceeding glad in persecution when characteristics like the ones shown above fall upon us for righteousness sake. How? The short answer is Jesus Christ. Jesus Christ walked in the path of this persecution for you and I. Because of his life, we can be saved from our sins. If Jesus Christ walked in the path of persecution, then persecution for righteousness sake can become a privilege for Christians as they have the opportunity to walk with Jesus in the path of self-denial and reproach. I once visited a Christian family who had a son. This son loved his dad so much. The dad had his own business using a small skid loader for landscaping. The son wanted to be just like his dad and do everything his dad did. The son demonstrated his love for his dad by playing with his toy skid loader and pretending to work like his dad worked. Whenever the son was given an opportunity he sat on his dad’s lap in the skid loader and experienced first hand the work his dad did. After he would come out of the skid loader he was so happy that he had the privilege of working with his dad. What Did Jesus Go Through? Opposed by united forces of Satan. Evil men and evil angels arrayed themselves against Jesus. His unlikeness to the world (divine compassion) provoked the bitterest hostility. Fiercest opposition and enmity because Jesus would give no license for the exercise of the evil passions of our nature. Why Did Jesus Go Through Persecution? Jesus went through persecution because his character was a perfect example of righteousness, love and truth. Persecution and reproach await all who are imbued with the Spirit of Christ. Are you beginning to catch the pleasure and gladness available by being persecuted for righteousness sake knowing that you are following Jesus? You have the privilege of walking in his steps. I find it praiseworthy to know God can take persecution and turn it into a blessing. Praise God! What a blessing it is to be a Christian. You are guaranteed strength according to all your days. Amen. Be blessed, be exceeding glad. Through persecution the character of God is revealed in His chosen ones. If you are a partaker of Christ’s suffering you are destined to be partakers of His glory.